Because of the difficulty of the course, we plan for a few shortcuts in case the day is not working out as planned. And on this course, plans often change. This year we had 17.7- and 24-mile options. This year 36 of the 62 starters completed the full 50k course, with Chris Pabian running strong from the start to finish first. Many other talented runners were in the chase, while others took it easy or backed down to one of the shortcuts, as they used this run to prepare for the fall running season. Christy Gray battled Ashley Carr throughout the race to finish first female. The Conococheague 50K is a free run, with five well-stocked aid stations made possible by donations from the runners. At the finish, runners are welcomed by Melanie and her chili, burgers, and other picnic treats. Melanie and I are very grateful for the volunteers that have become friends, who help clear trail, mark the course, run aid stations and sweep the course. Often, runners have come from two and three hours away just to help! 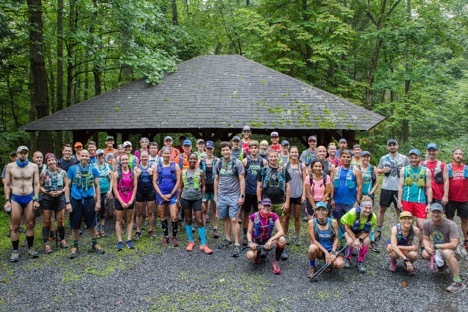 I want to thank the Harrisburg Area Road Runner’s Club for sponsoring this run, everyone who participated, all the dedicated volunteers, the DCNR’s Tuscarora State Forest staff, and the special assistance from my good friend, Ron Shields. I hope you all have recovered from this weekend’s adventure and will join us in March 2019 for the Tuscarora Trails Ultra 50K. Registration will open in early January. Information will be posted at www.donrunsfar.com.